It was a busy weekend for Shaken Not Stirred and it spanned a large territory from Palm Springs, to downtown Los Angeles, to the San Fernando Valley. I started out on Friday bartending at two different bachelorette parties in Palm Springs, drove back to LA to bartend a 200 guest wedding on Saturday, and then bartended a large birthday party in Panorama City on Sunday night. Needless to say, I served a whole lot of drinks. Palm Springs is usually pretty hot this time of year, and Friday it was a sweltering 118. When I pulled into town the sky was hazy from the fires burning near Idyllwild. I wondered if that would ruin the bachelorette parties I was scheduled to do. When I arrived at the first house, I could hear ladies hooting and hollering in the backyard. Obviously they weren’t going to let a little smoke ruin their party. I set up my portable bar out by the pool and started serving drinks. I served a Lavender cocktail that the host wanted, and it was a hit. Vodka, lavender syrup, and fresh pineapple juice. I also made jalapeno margaritas, and a vodka, grapefruit and basil cocktail. Part of the deal of doing bachelorette parties, is that the bartender also has to act as photographer. I don’t mind doing that, and I took many cool pictures with the host’s phone. The second bachelorette party started at 6pm, and I setup the portable bar inside the house. I was glad because it was still well over 100 in Cathedral City. 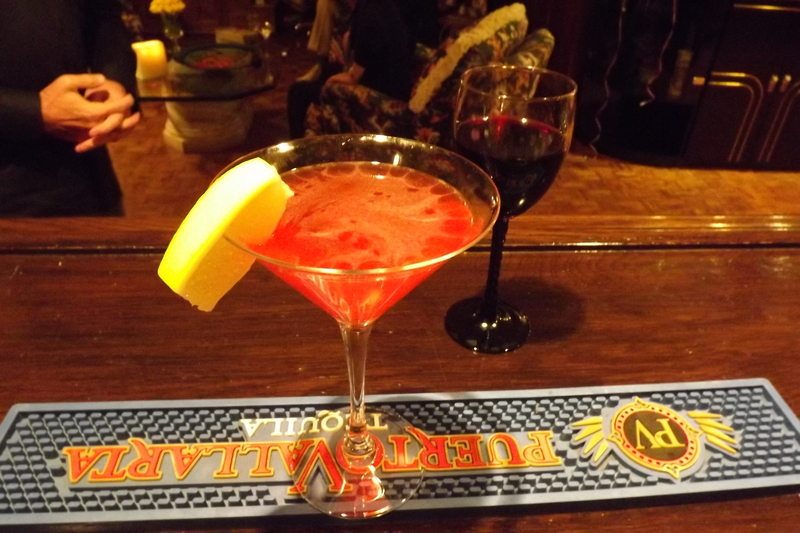 For this party, I was to do a presentation and make four drinks – a Lemon Drop Martini, an Old Fashioned, a Jalapeno Margarita, and a Watermelon Daiquiri. My phone died and I only got one grainy picture, but it seems the ladies had a good time and were dancing in the living room by the end. I drove back to LA the next morning and didn’t have much turnaround time and had to start setting up two bars for a 200 guest wedding at 802 Mateo Street in downtown LA. another bartender arrived to help me and we served Mojitos, and various vodka drinks. I was worried about this wedding, because we had been planning it for months, but everything came off without a hitch. Sunday night I was back in the San Fernando Valley bartending a 100 person birthday party at the Palacio Banquet Hall on Van Nuys Blvd. I served margaritas and various vodka drinks. It was quite a party with live entertainment, costumed dancers, and lots of great food. I served completely out of liquor by the end of the night. This coming week I have 8 parties scheduled and am sending out multiple bartenders. I have two corporate events, two birthday parties, a going away party, a baby shower, and another bachelorette party. I hope everything goes ok! Follow us on Instagram. 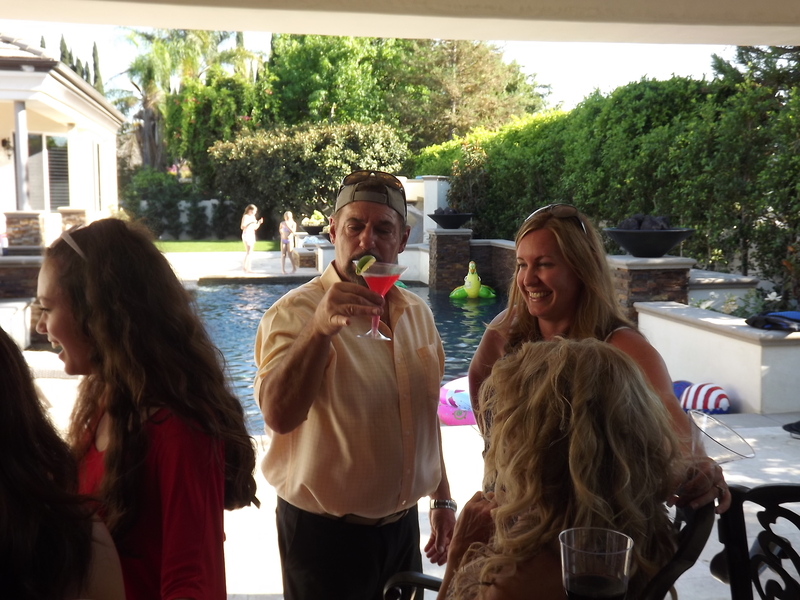 This year Independence Day fell on a Saturday and Shaken Not Stirred traveled to the community of Villa Park in Orange County to bartend a Fourth of July Party. I want to go on record by saying the Fourth of July is my favorite holiday. I love pool parties, hot weather, barbecues, and fireworks, and I especially love being an American and all that represents. This party that I bartended in Villa Park was the classic fourth of July party, and there couldn’t have been a better day for it. When I arrived, I was impressed by the home bar and pool area that the host informed me had just been completed after a lengthy renovation. I do many parties all over Southern California, and this had to be one of the finest home bars I have ever seen. Not one detail has been missed, including lighting, ice chest, 75” television, sound system, granite countertops, and liquor selection. They also had a grilling station just adjacent to the bar set up to feed an army. Behind the bar is a Bocci Ball court. The pool was set to a temperature of 85 degrees, and the kids in attendance rarely left it. 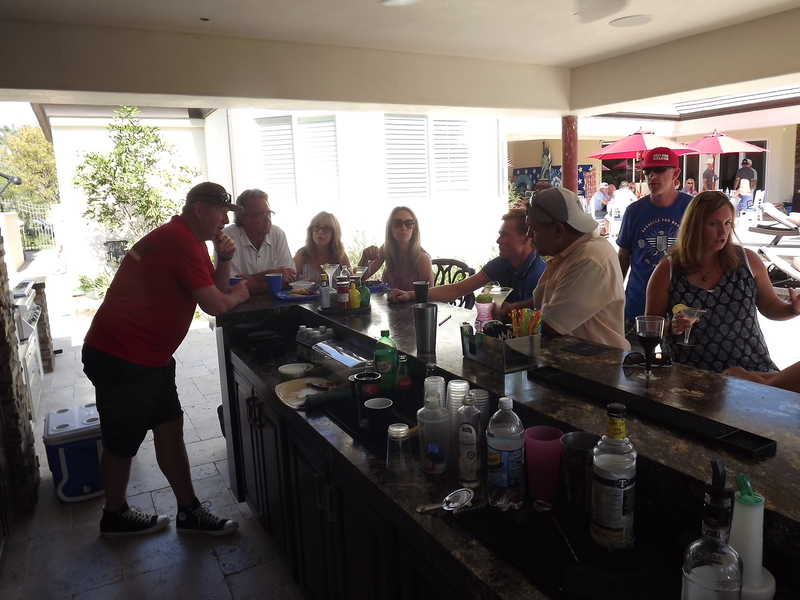 I served a variety of drinks including Cadillac Margaritas, Mojitos, Mai Tais, Pina Colladas, Cosmos, Dirty Martinis, Cuba Libres, wine, and beer. Lemon Drop Martinis proved to be the most popular drink of the day. We went through one and half 5 gallon kegs of Stella Artois, and a handle of Fireball. However, I didn’t see anyone over intoxicated. 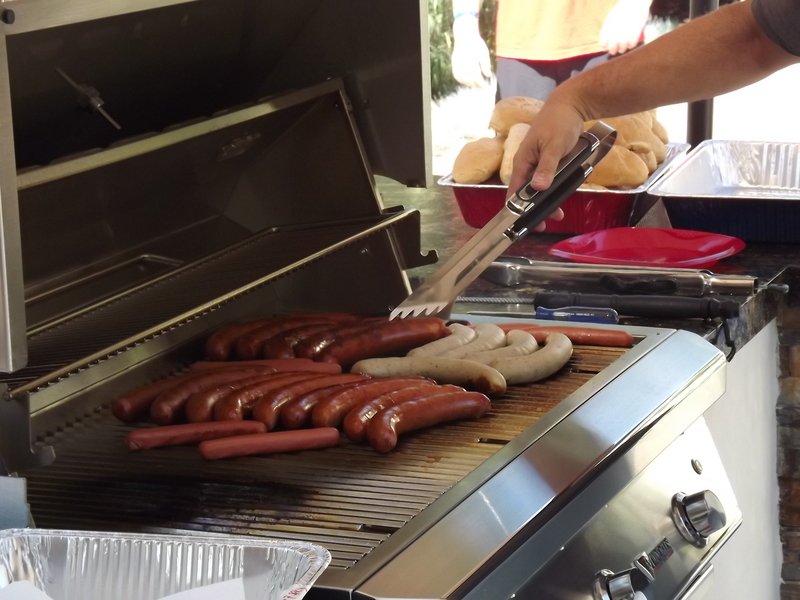 The host grilled genuine German Brauts from a local German Deli – we Americans can enjoy that! It was a great party spot, and I hope the hosts call me to bartend again. 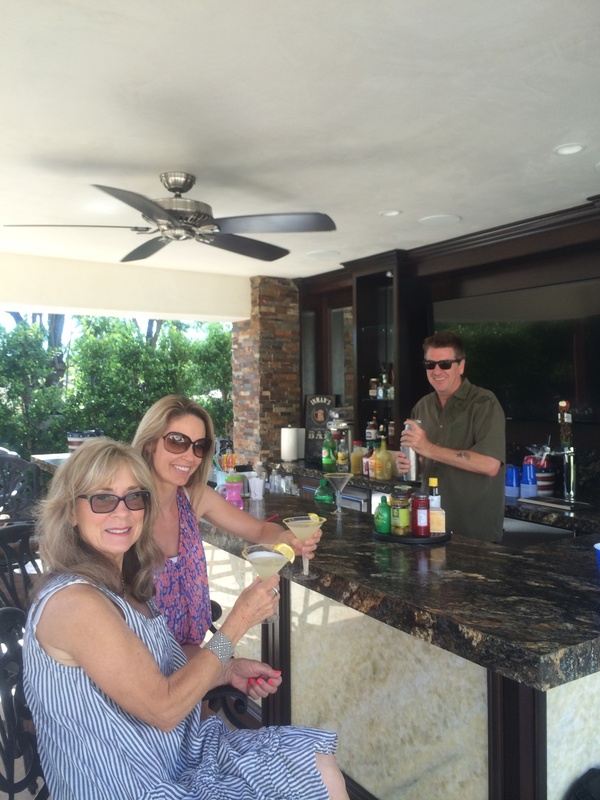 Great hosts and guests – It was a true pleasure to bartend and spend my favorite holiday in good company. I had a good discussion with a young man from Holland, and a woman who emigrated from England. They both knew more about the Declaration of Independence than most Americans do. They realized why America is important and stands out as one of the greatest nations in the history of the world. Sadly, many native Americans don’t seem to realize or even think about that. Personal fireworks were still allowed in Villa Park and fireworks rang out all over the neighborhood as soon as the sun went down. Freedom rang! Next weekend I will be traveling to Montana to visit family and friends. I will also be doing a book signing for my novel, “Palm Avenue,”in my home town at Sheridan Stationery on July 11th. I will be doing my first Southern California book signing at Book Soup on the Sunset Strip on September 8th. My next bartending event will be on July 18th in downtown Los Angeles. 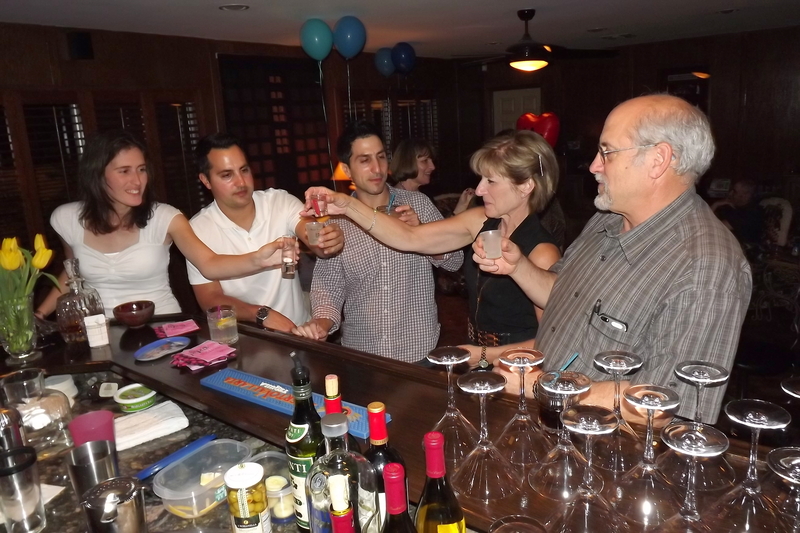 I have bartended 30th, 40th, and 50th birthday parties, and last night in Woodland Hills I was the bartender at my first 60th birthday party. The guest of honor thought she was going to have dinner with a few relatives, and got the surprise to see over 30 of her friends and relatives in attendance. Her son and daughter had hired me as the bartender. I have bartended many surprise birthday parties and it is always nice to see the look on the surprisee’s face when they get surprised. The house where the party was held was near Serrania Park in Woodland Hills where I have a lot of history. My kids attended Woodland Hills Elementary not far away, my wife worked at Woodland Hills Country Club, and we always brought our dog to Serrania Park. It is a really nice area in the San Fernando Valley and there are some very nice homes there. 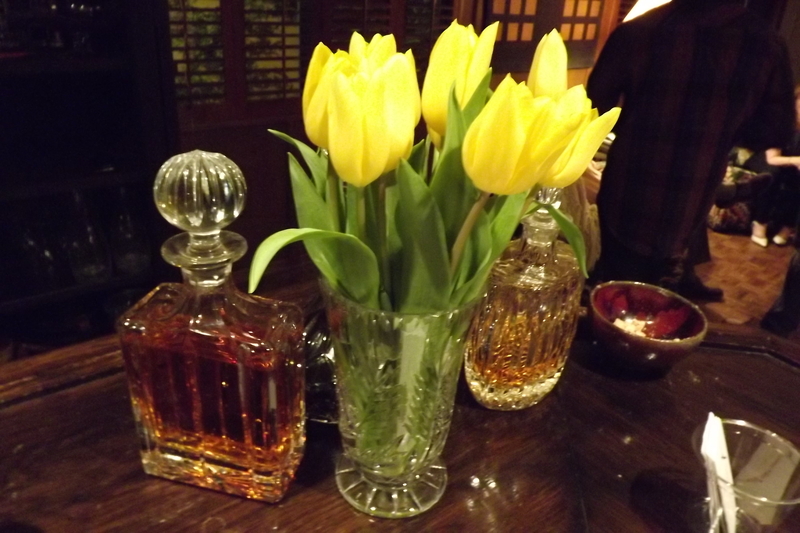 This house had a very nice bar and room for entertaining. They had purchased martini glasses for the party. I made cucumber martinis, lemon drops, cosmos, and classic martinis. I make the cucumber syrup and a lot of people really like it, but it is very concentrated and sweet and I have to be careful not to use too much of it. Last night I used a shot glass to measure it and I think the results were better. One of my clients complained in his Yelp review that the drinks were too sweet and I certainly took note. When I was drinking – I hated sweet drinks. Next week on Friday I will be bartending a 21st birthday party in downtown LA. That will be another first for me. It is a Moroccan themed party and I have to come up with some Moroccan themed cocktail ideas. Saturday I am bartending a strictly non-alcoholic party in Orange County and I came up with several non-alcoholic cocktails for that event. I am doing at least two events every week and hope during the holiday season, it will be at least three. If you are looking at this right now and you need a last minute bartender, don’t hesitate to call me. I will help you if I can. There have been times when bartenders didn’t show up when they were scheduled or showed up drunk and I stepped in. Weekends are my time to work and I love bartending parties all over Southern California and meeting new people. Call me! Follow me on Twitter.